In ungreased 13x9-inch (3-quart) glass baking dish, combine pasta sauce, soup and water; mix well. Stir in uncooked noodles, and bell pepper and onion stir-fry. Add meatballs; turn to coat with sauce. (Noodles should be completely covered with sauce.) Cover tightly with foil; refrigerate at least 8 hours or overnight. When ready to bake, heat oven to 350°F. Bake casserole, covered, for 45 minutes. Uncover baking dish; sprinkle with cheese and parsley. 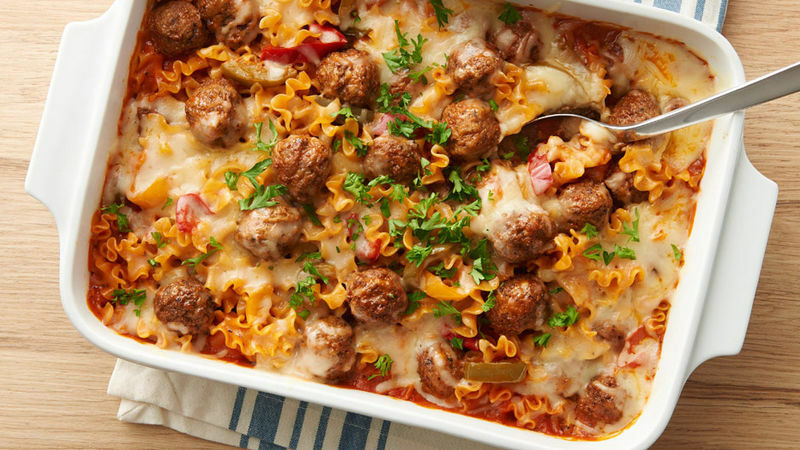 Bake, uncovered, an additional 5 to 10 minutes or until casserole is bubbly and cheese is melted.